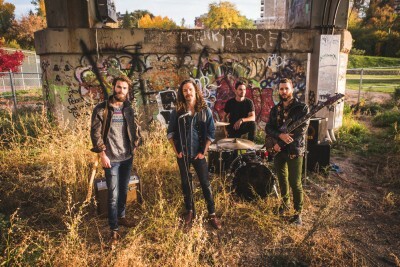 Bombargo, consisting of Nathan Thoen on vocals, Spencer Chilliak on guitar, Phil Kashap on drums and Graham Tilsley on bass will perform in Kamloops on March 19 at The Art We Are. Marlys Klossner: How would you describe your sound? Nathan Thoen: I think our sound is kind of a combination of a lot of different influences, from rock and roll to funk to soul, some of that indie Red Hot Chili Peppers vibe, and everything in between it. It really takes you on a ride when you listen to our new album especially, and even our first EP. We just write songs that feel good. We don’t want to limit ourselves to “Oh, we can only write hard rock,” or “we can only write chill indie.” Now more than ever people are looking for a broader sound. They don’t want the show to sound like just one long song. MK: What’s your writing process like? NT: It takes different waves every time we go through it. Sometimes I’ll just be walking down the street and be hit with groove and I’ll note the vibe of what I’m freestyling and send that to the band, and we’ll work it out musically. Lots of times Spencer [Chilliak], our guitarist, will bring a lick to the table and we’ll just jam and freestyle lyrics over it. From there we’ll hone in on a vibe and decide what this song is really feeling like. Sometimes we’ll come at it like “I have this story I’d like to tell, what kind of music can we come at it with?” It changes each time, but it’s always a really fun creative experience, especially since this is me and Spencer’s [Chilliak] first band. It’s a really fun process to be a part of. MK: Has growing up in Saskatoon influenced your sound? That actually came about when Spencer [Chilliak] and I went to a music festival together. We barely knew each other and kind of got to know each other at the [Sasquatch!] Music Festival. We had guitars and campfire jams. The tunes were flowing and took in the best lineup ever. We decided there that we wanted to start a band. Spencer said “I’m going to get really good at guitar.” He’s actually the craziest dude ever because he started eight hours a day just non-stop guitaring. He got really really good. With Phil [Kashap, drummer] it was pretty magical because Spencer said “Oh, if only my good buddy Phil was here he’d be the perfect drummer for this.” The next day, I kid you not, we get a knock on the door and Phil had decided to move back spontaneously and play music. MK: You decided to donate all the proceeds from your first EP to help people affected by the wildfires that ravaged northern Saskatchewan. How did that come about? NT: That came out of necessity. When it happened and the fires started roaring it was a huge bummer for Saskatchewan because we were not used to natural disasters and it was really aggressive. I forget the actual number but I think it was over 8,000 people were displaced from their homes. It was a massive problem. When it was happening we had just gotten our final masters back from our first ever EP. I pitched it to the band like “guys we just got our digital copies and I think we can do some good.” Everyone wanted to do something so we decided let’s put it out there and donate 100 per cent of our sales to helping out. A lot of people wanted to help but there wasn’t that many venues to donate on a smaller scale so when we set it up online to donate through our music, we were giving them a venue to donate and sort of rewarding them with our music. We were blown away by the positivity of Saskatchewan and people from all over Canada who bought our music, in turn helping out the victims of this natural disaster we were having at home. It was a really humbling experience. MK: You released your first music video for Precious Time at the end of last year. What was that experience like? NT: It was aggressive. I’ve always been a fan of filmmaking since I was a kid and with music and videos it’s a symbiotic relationship. We decided to shoot a multiple location thing but timewise it got so tight, it was like this is the day, we have two and half hours to shoot this thing. We loaded everything up and we played the songs fast so we could slow-mo it. We’re playing this song extremely fast. We probably played it about 15, 20 times with loading up the whole truckload of gear each time and driving to the next location, dropping it off, setting up and playing. At the end of it it felt like we’d just played three live shows in a few hours. MK: Is there a second release in the works? What can fans look forward to? NT: We’ve got a few things on the go, there’s always too many prongs in the fire with Bombargo. The biggest thing for us is “let’s work our butts off, but let’s have a really good time doing it.” We’ve got an 11 track album that we just finished recording in January. I’m very excited for it. This tour will be focussed on our EP and singles we’ve released, but we will be playing some of the stuff from the new album. We’ve also got a new music video coming out for a song of ours called Let It Grow.